2. ONE 4-WORD BOOK / FOUR 1-WORD BOOKS s.p., NYC, 1995. 4"x5 1/2", 2 comb bindings, B&W, Amiga Computer & xerox. 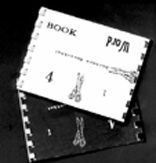 Another of Rosenthal's Interactive Novelties, this single book-object, locked by bindings on two sides, becomes four books if owner cuts apart. Each 1/4 contains a single meaningful word in each direction, that word being also the name of its font and an explication of its cover. A play on up/down, forward/backward, left/right, single/many, positive/negative, the beholder must follow individuated clues to determine order and procedure for unraveling the puzzle, and without this description, even reading the title is a challenge. 13. BUTTON PINS: NICE s.p. N.Y.C., 1995. 2 button pins: white background, black slogan. 1. "Don't expect me to be nice to you." 2. "I don't expect you to be nice to me." Completely hand-made by the artist with her own word-processor, circle-cutter and button-pin machine. "June 28, 1993. Warm sharp sunlight. Cool breeze all day. Perhaps I have begun to find beauty again. Loveliness, simplicity. Perhaps not just the ugly, tawdry, imperfect. Perhaps with the beautiful spring I can begin to look at life and see my surroundings through a filter of appreciation, and not with the lens of sourness which now transmits only the alien, substandard .... Perhaps I might begin to partiak of the world, not rival it. Perhaps a new era of integration has begun. 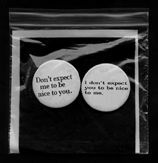 / Idea for button pin: 'Don't expect me to be nice to you.."
This work is another of Rosenthal's interactive pieces born from her idea that verbalization of her own psyche produces ore for others. A packaged assortment of original postcards and greeting cards by Barbara Rosenthal some related to the artist's books, others independent. Color and B&W. 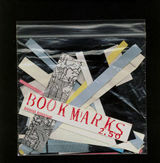 A packaged assortment of B&W and colored bookmarks, recommended for flagging your favorite pages in your favorite classics, thereby compiling an "exploded book." 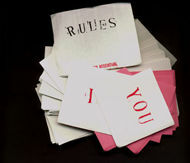 A packaged card game about Art and Life (rules included but purchasers are encouraged to vary them.) Originally designed by Barbara Rosenthal to play with Linda Montano, and played in the window of The New Museum of Contemporary Art in New York, Easter Sunday,1986. 17. POCKETFUL OF POESY. INTERACTIVE NOVELTY s.p., N.Y.C. A pun on poesy/poetry, this hand-made denim pouch-pocket (8 inches wide by 9 inches high, by 1 inch thick, fastened by two 1/2 diameter grippers) holds several dozen of Rosenthal's original poems and short stories, as well as her post-cards, hand-cards, photos, xerox pieces and miscellaneous printed materials. Each pouch is slightly different and contains slightly different contents, updated as long as the edition remains open )under 10 of existence as of Nov. 27. 1996).